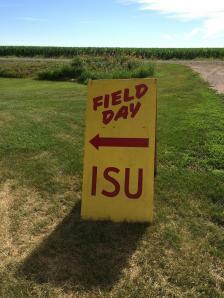 The featured stops for this year's field day include a presentation on UAVs with a demonstration and discussion on the basics of imagery, farm pond management, and a closer look at the ISU yield forecasting tool, FACTS. Check out the Fall Field Day flier for additional details. The field day is free and open to the public. Certified Crop Advisor Continuing Education Units will be available, contingent upon approval. To reach the farm, follow U.S. Highway 218 one and three quarters miles south of Crawfordsville, then two miles east on county road G-62, then three quarters mile north. Signs will be posted to guide you to the event. Click here to bring up a Google map of the farm. For additional information please reach out to Meaghan Anderson, Virgil Schmitt, or Rebecca Vittetoe.